For $5,000, Martini & Honda, On The Rocks, Say What? In Hollywood lingo, the Martini Shot is the final set up of the day after which you get your drunk on. Today’s Nice Price or Crack Pipe 1982 Accord might be staring in a European flick because it’s painted in Martini livery, but will its price have you yelling action!? You’d need to down martinis, or some other form of inebriant, in quantity to pay the asking price on yesterday’s wicked custom Subaru Sambar. Or at least that's the takeaway from its towering 90% Crack Pipe loss. Its price may have made it a van no-go, but there’s no questioning that a tremendous amount of work that went into the little ride. There’s also a good deal of work that’s gone into the customization of today’s 1982 Honda Accord hatch, and we’re going to need to investigate whether it’s something you all could rally around. The Martini & Rossi distillery has been sponsoring racing teams for more than 45 years, and I can remember cheekily bastardizing their ad slogan - Martini & Rossi on the rocks, say ye-eh-essss - to Martini & Rossi and rod knocks, say cra-a-ash - when I was a kid. Still, the maker of Vermouth has been a loyal patron of the sport, and their multi-hued livery has been a common sight in the winner’s circles at Le Mans, F1 circuits, FIA rallies, even the Powerboat World Championships, for those who don’t mind their booze a little watered down. And today, the emblematic red, white, and blue hues and MARTINI label adorns. . . . a 1982 Honda Accord. Wait, you’re saying, this is a classic rally Accord, right? One that the company campaigned back in the day and whose sponsorship by the booze maker at the time went unnoticed? Yeah, no. This is the clever creation of an individual with a modicum of talent, an old Accord, and a desire for romance - the ad describes the car as a (g)reat way to meet women, this car is a CHIC MAGNET! :). Why it attracts so many chic individuals is beyond me. Maybe he meant Sheiks? Regardless of for what this Honda acts as bait, it does, at first glance come across as some sort of long lost rally car. In addition to the livery, the builder of this custom has added a number of scoops to the hood and sides, as well as driving lights and a set of walleyed amber units on the front bumper that look a little sad. Under all that, the body looks okay, there only being some evidence of rust - or is that just road tar? - on the door edge to cause some worry. It should be noted that it sports alloys off of a VW 16V Scirocco, wheels that have always stuck me as odd because the teardrops on them face one-way on the right side, and the other on the left. Freaky. Mechanically, the car is stock, and that’s probably a good thing. That also means that the car is powered by a 1,751-cc CVCC (Compound Vortex Controlled Combustion) four cylinder that at one point in time made around 75-bhp. That’s mated to a 5-speed stick, and the whole shebang is set up to give you bragging rights for gas mileage rather than rock spewing sideways driving. No pics of the interior are offered, but the ad gives the impression that it too belies the rallytastic exterior appearance. The early Accord was beloved for its build quality, feature set, and on-road competence, all at a reasonable price. One thing that was lacking however, was quirky individuality. That's because part of the Accord’s mantra was consistency and lack of drama in either appearance or operation. This one, adorned as it is in Martini livery, adds that quirkiness, and makes the car weirdly wonderful. 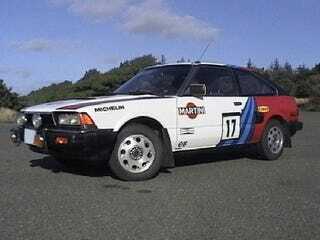 Of course quirkiness comes with a price, and in the case of this Martini Accord, that’s $5,000. Five grand is a good bit of change for a 31-year old Accord, and so you now need to take the livery and overall condition of this one into account in the determination of the appropriateness of someone paying that much. 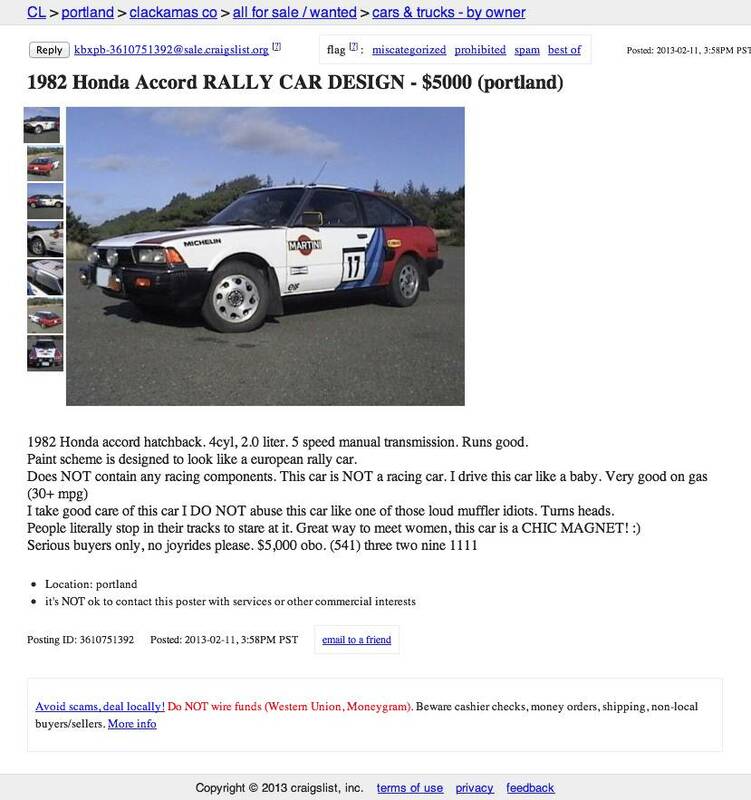 What do you think, is $5,000 a fair price to rally around this faux racer Accord? Or, is there not enough vermouth in the world to get you to pay that much? Portland Craigslist or go here if the ad disappears. H/T to civardi for the hookup!